For commercial projects, the City will now grant a 12-year, 100% abatement for achieving Silver, Gold, and Platinum Certification; the most basic LEED Certification is no longer eligible for abatement. 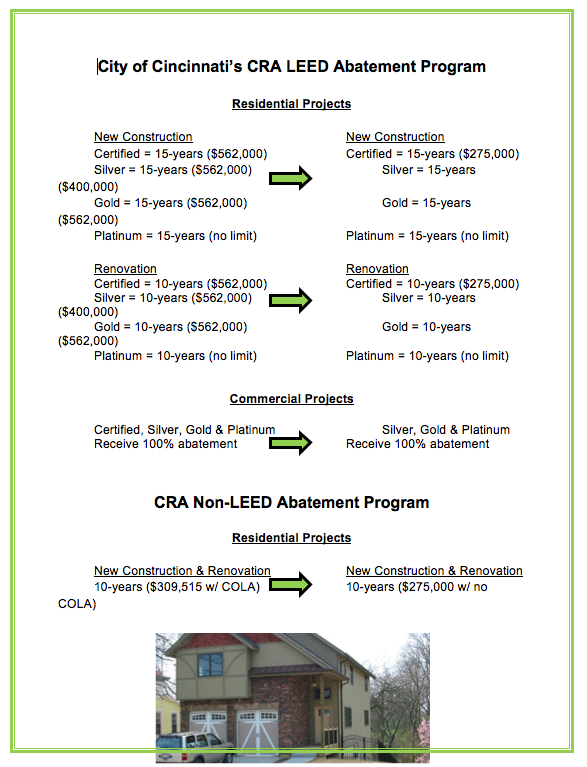 For residential projects, all 4 levels of LEED Certification will still earn the 15-year property tax abatement, but the value cap for each level is now tiered, encouraging residents to aim for Silver, Gold, or even Platinum Certification. The new value caps are in the attached factsheet. “I think this change by the City will convince people to invest a little more upfront to get to a higher LEED level,” says Marc Hueber. His company John Hueber Homes built the first two LEED homes in the state of Ohio and has now completed 22 LEED homes in Cincinnati. The company is also renovating historic properties on Race Street in Over-the-Rhine to LEED standards. Tony Hobson, Vice President of North American Properties, has partnered with Dan Schimberg of Uptown Properties to build more than 300 units of LEED market rate housing in the Uptown area. “We never would have built 65 West or Euclid Square or Views on Vine without the City’s tax abatement,” says Hobson. He says Cincinnati’s LEED program has resulted in more than $300 million worth of needed urban residential housing in the Uptown area. All of their projects to date have achieved LEED Silver. The LEED ordinance passed by Council in 2006 has resulted in a total of 164 LEED certified new and rehabbed buildings in the City. Most are certified at the lower LEED or LEED Silver levels. Changes in the ordinance will incentivize investing in LEED Gold and Platinum. Quinlivan’s Strategic Growth Committee unanimously approved these amendments to the City’s LEED Abatement Program and the full Council will vote to implement the changes in its last meeting of the year on Wednesday, Dec. 19 at 2pm. Homebuilders and commercial builders gave input that helped craft the final ordinance. If passed, the new abatement scale is effective Feb. 1, 2013. Anyone who has submitted a complete building permit application to the City prior to Feb. 1 will be under the current ordinance. As this is another example of Cincinnati’s ‘green’ leadership, environmental advocates are encouraged to fill out speaker cards for tomorrow’s public comments portion at 1:30pm and share with Council how important this continued leadership is for the City. To view or download a video documenting construction of Quinlivan’s LEED Gold green home, go to http://vimeo.com/22485890. 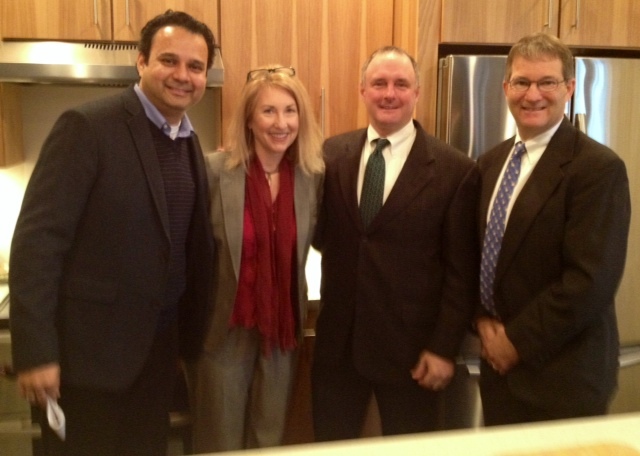 Caption for attached photo: Sol Developments’ Sanyog Rathod, Councilmember Laure Quinlivan, USGBC Architect Alan Warner and Tony Hobson, VP North American Properties, standing in LEED Silver home in Northside owned by James & Heather Kinsman.